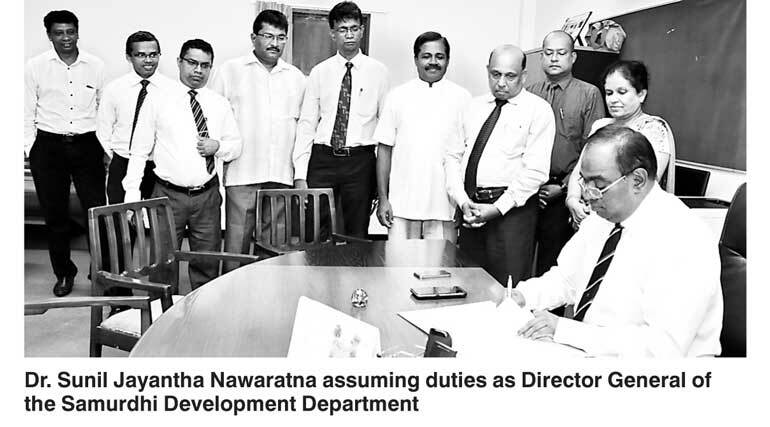 Dr. Sunil Jayantha Nawaratna has been appointed as the new Director General of the Samurdhi Development Department, the biggest institution under the Minister of Social Empowerment, Welfare and Kandyan Heritage S.B. Dissanayake. Prof. Nawartna assumed duties yesterday. He was also the DG of the Samurdhi Authority. Previously he has served as the Secretary of the same Ministry, as well as Secretary of Higher Education and Ministry of Parliamentary Affairs, Director General of National Youth Services Council, Chairman, Centre for Strategic Management and Advisor to the Ministry of Agriculture and Livestock. Dr. Navarathna holds a B.Sc (Business Administration) degree from the University of Sri Jayawardenapura, an MA (Economics) from the Kagawa University, Japan, and a PhD in Management from the Keio University, Tokyo, Japan.